The concept of time is funny. It is the essence to our lives, without time, there is no begin and no end. Time is where we start and time is where we end. And after experiencing the three – almost – longest hours in my life, the concept of time became very clear to me. You can be the fastest and take up no time or you can be the slowest and take up all the time you need. Needless to say, I opted for the second (I will leave out here, that I actually didn’t have any other choice than taking all the time I could, just because I am not a fast runner… never have been and probably never will be). When I was young I hated to go to museums with my dad. He wanted for us to experience “culture and history” and both, my older brother and I disregarded him, mainly because he took sooooo much time to look at everything. Every single artificial had to be examined for at least half an eternity (when in reality he just read through the plaques and made some comments about it…). It has always been like this, no matter what my dad looked at, it took forever. Whether it was my math homework, that I just didn’t get and he tried to figure it out or when he tried to explain to me how to take care of a car. Everything he did always took forever. And when you are a child, everything seems so easy and not at all complicated, why would anyone need so much time to understand? Several years later and now it was him, waiting for me. Waiting for me to finish the marathon with him. And so we briefly reversed the roles only to fall back into our old roles the very next day. A and I have never been to a city and not visited the aquarium. Paris, Brussels, London, Vienna, Baltimore, Atlanta… we always went to the aquarium. And there we were again, in Bergen. My dad reluctantly agreed to come with us to the aquarium only to find out that both A and I are like children when it comes to aquariums. We were running around, aaaah-ing and oooooh-ing at every tank, trying to figure out where the snakes were hiding, how many different types of fish were in the tank and how heavy the crocodiles were. We practically sprinted through the aquarium because there is always so much to see and we don’t want to miss anything. We even got to hand-feed some huge gold-fish and tell you what, it’s addicting. I even got my dad to try it out and soon enough, after all the children lost their interest in feeding fish, we were the only people begging the aquarium-lady to give us more food so we could feed the fish by hand. On our second round through the aquarium, usually we do several rounds since we find something the second time around that we didn’t notice the first round, we found my dad standing in front of a huge tank. We stood next to him and looked at some alligators. Much like the alligators, he didn’t move, just staring at the little creatures. He then leaned over to me and said, “I don’t think that the alligator is real”. I gave him a puzzled look and he explained, that the alligator hasn’t moved for 10 minutes. So I asked him, if that wasn’t exactly what alligators and crocodiles do? Not move? That’s their strategy, right? Correct me if I am wrong. He tilted his head and said, “but he also looks really shiny”. 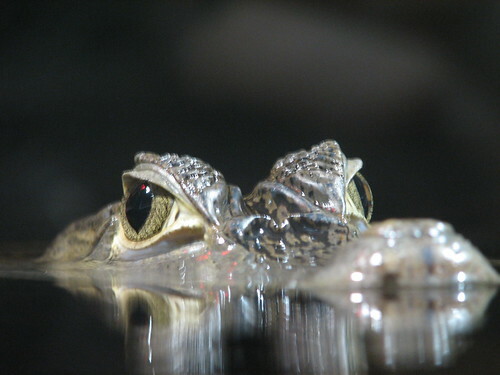 I carefully examined the alligator’s skin and noticed that in fact, it was really shiny. But I shook my head and said, no way. This alligator had to be real. About 15 minutes later we found ourselves standing in front of an even bigger tank and three even bigger alligators and the guessing began again. Dad already decided a long time ago, before we even stood in front of this tank, that most of the gators in this aquarium weren’t real, but I tried everything to convince him otherwise. And when I mean I tried everything, I really did. I waved my arms, started dancing, ran from one end of the tank to the other, just to get the gators attention but NOTHING. We stood in front of the gators for about 45 minutes and I was about to give up, almost admitting defeat, when finally, one of them moved. It wasn’t much but he (or she?) did move, proofing me right, that in fact, the alligators were real. By then A and I already lost all our “grown-up-ness” and we were just acting like children. A found out that his new phone actually reacted to his voice so he ran from tank to tank shouting “shoot” or “smile” at his phone screen and waited for it to take a picture. While I was imitating all the fish and pretended to be a shark. We watched the penguins get fed and the seals get trained and I think I can safely say we all were really impressed by this aquarium. Time flew by. We enjoyed another couple days with my dad in Oslo (doing some Zumba) and then it was time to say goodbye. I hate having to say goodbyes but I guess that’s normal. I don’t think dad really was ready to say goodbye either but sometimes time goes by way too quickly, other times it doesn’t pass at all. Always love seeing an alligator. Fun shot with an interesting perspective.